My family has a long tradition of holiday cookie baking (see holiday cookies) and we have many recipes from family and friends that we look forward to and make only during the holiday season. These Viennese Crescents, recipe from my Grandmother, are one of our favorites. When we make them, we know Christmas is approaching. 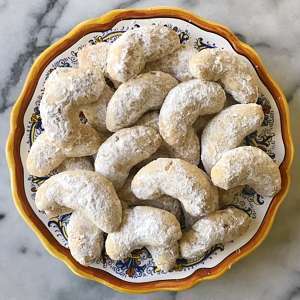 They are light, have that perfect buttery cookie texture somewhere between chewy and crunchy, a hint of almond, and are rolled in confectioner sugar… so yummy! No matter how you make them, they are always a hit! A recipe from my Grandmother, this is one of our yearly holiday cookies... Light, buttery, a hint of almond... always a fan favorite! NOTE: Prep time includes refrigerating dough for 1 hour. In large bowl, combine flour, confectioner sugar, salt. Mix with a pastry cutter or mixer. Add butter, nuts,and extracts. Mix until thoroughly blended. Shape cookies: Form dough into 1-inch balls. Then, with palms of hands, roll each all into a 3-inch long roll. Place rolls 2 inches apart on cookie sheets; curve each roll to make crescent shape. Bake 10 – 12 minutes, or until set, but not brown. Let cookies cool on baking sheets. Then roll cookies in confectioner sugar, turning gently,to coat both sides..